Philly Tarot Deck – Zero Equals Two! On our turf it’s big news that the Philly Tarot deck has been completed and is now for sale. Based on the style of the Rider-Waite deck, this set of cards features iconic figures from Philadelphia’s long, often distinguished, sometimes denigrated history including Rocky (the statue thereof, originally installed at the top of the steps to the Art Museum and then exiled by that institution’s administration to a wooded nook near the bottom of the steps for being too low brow; meanwhile the stream of visitors looking to take selfies with said statue is never ending – SO PHILLY!) as Strength, “Fresh Air” hostess, Terry Gross, as the High Priestess, Danny DeVito (as Frank Reynolds from It’s Always Sunny in Philadelphia”) as the World. WHAT THE HELL IS NOT TO LIKE! A few of these cards were created to illustrate a Philadelphia Magazine article on the resurgence of interest in tarot and the artist launched a Kickstarter campaign to finance the creation and manufacture of a full deck. His initial goal was $6K and change – and he netted over $40,000! “Welcome to the Philly Tarot Deck! I hope you enjoy using this deck as much as I enjoyed creating it. I’d like to thank all the Kickstarter backers who helped me launch this project with such fervor. Your support and enthusiasm carried me through the challenging task of crafting a 78 card deck in the short time of three months. 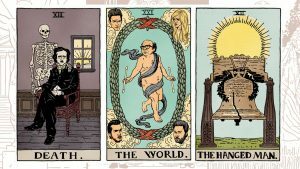 “I also need to give a huge thanks to Philadelphia magazine, in whose pages the idea of a Philadelphia-themed tarot deck was first envisioned. In the October 2018 issue, writer and editor Gina Tomaine, also the author of this guidebook, wrote an essay about the local popularity of tarot reading and astrology. To accompany the story, art director Alyse Moyer hired me to illustrate three Philadelphia-themed tarot cards. After the article was published, the overwhelming positive response made it clear that a custom tarot deck was something the city not only needed, but deserved. Thus, the idea for the Philly Tarot Deck was born. Thank you Gina and Alyse, this deck would not exist without you! GET YOUR NOW Ya Jabroni! You know it’s your jawn! PS if you look for images of the deck and note that The Fool appears with a “?”… it’s actually the Philly Phanatic. The Devil card features Gritty!